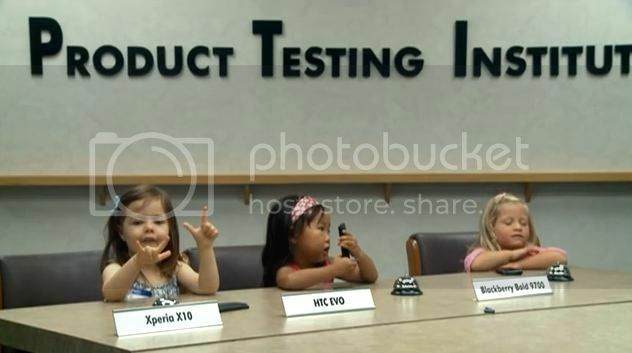 Sony Ericsson has released a number of hilarious videos about the Xperia X10 that shows the rigorous testing that takes place at their ‘Product Testing Institute’. They have produced five videos with various groups including glam rockers, guidos, surfers, models and toddlers. All deserve a watch and you can check them out below. My favourite was the one with the toddlers. What’s yours? So that is how we end up with 1.6 instead of newer versions. They should have gave it to geeks instead. I fall under 4 out of 5 of those categories! The X10 is definitely for me! But am I the only one in here that thinks Sony Ericsson can invest the resources used to produce these ads in something more useful? I dont know, something like hiring more QA teams to finalize and release Eclair and then start working on Froyo??? I am right with you. All I want is a decent 5mp+, a decent media player and a large screen to view my movies. I can only foresee a HD video upgrade with autofocus that really catches my attention. But other than that,that’s all I need! X10 is perfect the way it is for me the way it is, with or without the upgrade. Bayhas Kana – couldn’t agree more. Sony are just making themselves look a joke in the industry. And I’m already preparing myself for the inevitable ‘slip’ for the 2.1 update to the end of the year…sigh…perhaps one day I’ll be able to install the Google Earth, official Twitter app ect ect.. and news of the new handsets means I’m also waiting for the inevitable abandonment of X10 to 2.1 only. And hint to all the product developers at Sony – learn from your mistakes and your triumphs – why is it the best camera I’ve ever used on a modern phone was the K800i – with a *proper* Xenon flash – why bother with LEDs if every review and surely your own product testing reveals they are USELESS for indoor shots. As long as we get some updates before the end of the year I’ll be happy. As is, the phone works great for pretty much everything I want it to do. I actually like the LED. I think it’s more useful for video than taking pictures. It works great as a flashlight. If I was going to use a flash I’d grab my SLR and do it properly. The camera works reasonably well in low-light anyway(as long as you have steady hands). These videos are…stupid. It’s funny, but it doesn’t really says anything about the X10 itself. Man you people need to relax. Its just some fun videos, sorry its not your android update. Bunch of ungrateful babies. You would probably complain if you were hung with a new rope. I have an x10, I can wait and so can you just like everybody else. 1) it should be possible to sync your telephone contacts to the moxier, and not only moxier to telephone contacts. 2) I would like all my emails in one app. As for setup, it was easy. I use Exchange from Godaddy. It’s not a waste of development money it’s marketing money, and in my view view well spent! I don’t think these are a waste. Smart, funny, and made me want to watch all of them. Sony got their wish. I even “liked” this article on Facebook. This is a marketing scheme, nothing more. Looks like they didn’t put too many resources into it anyways guys. The few bucks necessary to make these shorts would barely put a dent in the resources for development of the eclair update. I’ll rather be a toddler if i had to choose! cool commercials! im the guy in the commercials, asking the questions. thanks for all the nice compliments. LOL so funny ! i love it . x 10 is a awesome phone ! if your to dumb to use it then throw your self of a brige . People, I need a favor, if someone can help me it will be great! Can I download and install any of those on my X10 and how to do that? Thanks a lot, best regards to all. Next post: Sony Ericsson prepping 1.2GHz Android smartphone with 12MP camera & 1080p video?